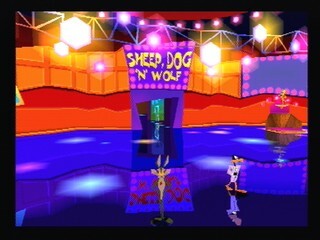 Released in 2001 by Infogrames for the PlayStation, Sheep Dog 'n' Wolf (or Sheep Raider) is a game about a Wolf that steals sheep and his interactions with various Warner Bros. cartoon characters. His name is Ralph. The poor bugger. Not much to comment, you just run through the map as fast as possible. I should maybe have turned a bit before launching with the rocket, but other than that it's pretty self-explanatory. Luring the sheep over the bridge in one take saved a good amount of time. You can get the sheep to move over the entire bridge so that you would not have to run back as far to get it, but that's hard to do while maintaining a fast pace. Using a tree in order to reach higher grounds is quite efficient and there will be more examples of this later on as well. This level was featured on a demo disc back in 2001 and it was the first level I ever played. It was pretty much the same level as I remembered it and there aren't really any shortcuts here that I know of. Running across the field without getting caught is quite tricky, and Sam will catch up with you sometimes and sometimes not, even if you're running the exact same way all the time. Guess that have to do with how much he gets stuck on his flock while trying to reach you. I redid this segment a couple of times since the sheep wouldn't always move that fast when attracted by the scent, and the sequence when you fling the sheep inside the goal could sometimes make Ralph stand still for about 2 seconds for some reason. Stopping at the edge of the seesawwas not intended at all, pure luck there. Sneaking up close on Sam and luring a sheep from there is possible, but I decided not to go for that strat since I didn't think that it would save me any time. It's very important to sync Sam's field of vision with your movement so that minimal waiting time is required before sneaking around the rocks. Launching off and landing directly inside the goal looks cool too. Skipping the flute here by trolling Sam with Ralph's exquisite jump technique is a really nice timesaver. I discovered this trick the first time I played the game when I tried to stand on the small rock next to Sam, with the result of Sam running around like crazy without reaching you. It was easier and faster to just jump over him rather than trying to land on the rock and then run towards the bomb area. You don't actually think of it at first, but all bombs (that can be disarmed) are possible to jump over or get past in other ways without disarming them first. This saves a great amount of time and it was quite a relief when I noticed that the last two on this level (just by the seesaw) could be skipped too. It's also possible to set off bombs without blowing yourself up, but unfortunately I didn't get any footage of that here. Running across the two floes in the beginning and hitting the geyser right after makes up for a good start. The jump from the crane to the nearby rock is very, very hard to do that fast – basically you have about an inch to stand on and reaching up to the rock with minimal approach takes and endless amount of tries before you actually make it. It may look like it's easy but trust me; it's not. It saves a good amount of time though so it's well worth the wait. Apart from hitting the mailbox unintentionally I really like this segment. Dashing around the corner where Sam is standing and managing to time it perfectly with the "warp holes" was a chance that turned out great and everything after that went well too. The first time-travel level out of two. Utterly boring and somewhat anti-speedrun, I think it turned out OK after all. The lava that's flying all over the place can hit you when you least expect it, and I was really having the frames on my side while moving the rock that you use to reach the seesaw while holding the sheep. You may notice how careful I approach the bull with Gossamer behind me; you may get run over by them once the bull start chasing Gossamer around the goal which is not that funny when you've practically done the whole level already. One of my favorite levels in the game, wide and open with no real obstacles. Jumping past a bunch of bombs and sneaking up on Sam is really efficient when it comes to saving time but I was really lucky that he didn't hear me when I moved towards the sheep. Getting the sheep with you at the first try with the elasticis a bit tricky but nothing out of the ordinary. This one was believed to be one of the levels that would take most tries, but I got it down much faster than I thought I would. Since you can't do anything special here it comes down to plainly memorize which way to go and what do to in which order. Missed the jump to the seesaw which was bad, but that's nothing major on a level this tedious. The boss itself is chapter of its own; I don't know about you, but the fact that you have to jump in on his territory and THEN run around in circles doesn't make sense to me. The wheels are also way too small to stand on and it's very easy to fall off if you're not careful. I got them rolling pretty fast still, and there aren't any significant mistakes worth mentioning here. The floating raft glitch is by far one of the most usable glitches in the game and it looks ridiculous when you're drifting around in mid-air. Credit goes to poomrus for this one as well since that's where I first saw it, even though there are several other videos of this glitch out there. On the PC version of the game, it's possible to cancel Sam's alert up on the ledge with the lettuce by jumping in the corner, but no matter how I tried, that did not work on my copy. With this in mind you have to bring the bush with you in order to get to the ledge. I figured that you wouldn't really need to get across the gap in order to complete the level and even though I couldn't do this one the way I had hoped for, it turned out pretty good under the given circumstances. It still bugs me that Ralph wanted to go for the lettuce first before picking up the sheep, and if you look closely you can actually see that I tried to move away a bit to avoid this. Oh well, you win some, you lose some. Apart from accidently face-planting the wall in the end I'm satisfied with this one. I should have used the right analog stick to move the camera myself here, but I got used to that technique later on.